As you can imagine in running Belles and Gals, I head to a lot of gigs, but I don’t head to many which are headlined by male artists. However, i do see many male artists as support acts and one artist who really caught my eye was Thorne Hill. He appeared at Jeannine Barry’s Troubadour gig earlier this year on the support alongside Katy Hurt and all three acts were just excellent. So, when I decided upon which male artist I would interview first, it had to be Thorne Hill! Hi Thorne, Thanks so much for becoming our first solo male artist to be interviewed on Belles and Gals as part of our all-male weekend. It’s very rare for me to listen to an album by a solo male artist too, but I have to say I was impressed! For anyone who hasn’t listened, how would you describe your sound? That’s an awesome question as I have heard so many people describe it as so many different things. If I had to I would describe it as Modern Contemporary Country with a British twist. I have always been a fan of Country Music and have many influences from all the eras. I wanted to stay true to what makes US Country so epic yet put my own stamp on it. I feel this debut album does that and hope everyone that hears it loves it as much as I loved making it. 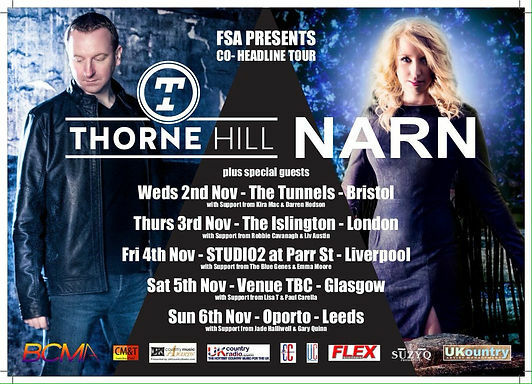 I was lucky enough to see you perform live in London not so long ago when you supported the fantastic Jeannine Barry. You seem to really enjoy your live performances! Is there anything better than performing live? Haha. I feel like that’s a loaded question. “There are many things in life I value as much as performing live of course” (is the loaded answer). However…….. I love the rush of performing. There’s nothing quite as exhilarating and soul enriching as engaging with an audience and being able to share my songs and stories. Making that connection is the most important thing to me. Especially when a song really reaches someone and touches them on a deeper level. One of my favorite songs on the album is ‘Open Road’ and I’m also a big fan of the video too! Tell us all about the song and the video? I had the pleasure of doing a few writing sessions with Scott Poley and Chris Howard (the co-writers of Open Road) and we had a great time bringing life to the songs we wrote. Open Road in particular was a fun writing session of which the spark was a photograph Scott showed us of a sunset from a car whilst he was driving across the states. We talked about how freeing it must have been and what he felt in the moment of taking it. The song pretty much wrote itself from there. We wanted to get across that feeling when you are doing nothing but living in that very moment. You don’t care what’s come before, what’s to come after. That moment when you are completely present and nothing is in your way. The video was filmed on a very quiet Sunday evening in Birmingham. We wanted to get a lot of footage on the motorway to represent the “Open Road” and have a bit of fun. We wanted the Music Video to be less focussed on literal interpretation but we wanted to get the feel right. So we used the “Open Road” and took some creative freedom. In the past you’ve played at the Country2Country festival? How good an experience was that? C2C was an amazing, fun and learning experience for me. I am not ashamed to say I was completely unprepared for it. It was at the beginning of my solo career and I think looking back on it I wasn’t ready. I don’t regret it for a second though. To me every experience is valuable. Whether it be a success or a failure, a life changing event or a lesson learned. It’s all brought me to where I am now and I’m thankful for everything and everyone that has got me here. Since then I have come so much further. Far enough to say I am ready to go and give it my all if I get the chance. I would love the opportunity to take the full band show to C2C 2017. You were recently named the UK Country Radio Male Singer of the Year! That must have been quite an honour? It’s an awesome achievement that I’m incredibly proud of. The award nominations have been overwhelming since the album was released and to win one already is amazing. Next, we’re looking forward to the BCMAwards as I have 3 nominations there too so that’s very exciting. So, what was it that got you into country music in the first place? And which musicians have influenced you over the years? Music always filled my family home growing up and I was introduced to some of the older artists as a child. The likes of Jim Reeves and Glen Campbell were favourites of my parents. However my Country addiction didn’t fully take hold until the 90’s when I was introduced to CMT. From then on I was hooked!!! Artists such as Garth Brooks, Martina McBride, Tim McGraw, Faith Hill and Trisha Yearwood saw me through my impressionable teen years. Haha. Current artists I love to listen to are Carrie Underwood, Rascal Flatts, Little Big Town, Chris Young and David Nail to name a few. There are many things that make Country Music so special to me. The style and the instruments, the little nuances and hooks but above all, the stories and their ability to connect with the listener like no other genre can. Well to me anyway. Have you always wanted to be a recording artist? Also, tell us what the very last album you played in the car was? After spending a good 10 years working worldwide in the Music Industry in numerous genres I always felt a draw to Country music. Whenever giving the opportunity to perform solo I would always sing all my favourite country songs. When I returned home to the UK I knew Country was where I wanted to firmly plant my roots and these last 5 years I have been performing and writing relentlessly. I’ve taken many jobs to support bulilding my career and one of them was/is as a session singer. Honing my skills and craft in recording brought on a passion I never expected. 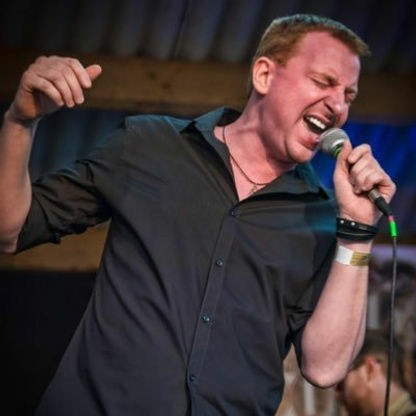 Even though my focus now is on Live Performance I still record backing vocals for artists all over the globe and have even featured on some of our very own UK Country Artists albums. Last Album I played in the car was The First Time by Kelsea Ballerini – do love the single Peter Pan. The last song I played was Forever Country. I love the mashup of the three songs and think they’ve done a stellar job to celebrate 50 yrs of the CMA. I can’t imagine that the song choice was easy by any stretch. What would you say has been the best moment of your career so far? So far there have been many many moments I have enjoyed. The highlight so far I would have to say was the Album Launch in Liverpool. The day we finally unleashed Thorne Hill to the world. The response was electric and what has followed has been unbelievable. I can’t wait for more and more moments to be shared with the awesome fans!!! Tell us something completely random about yourself! Going back to the Peter Pan comment. I am a massive Disney fan. Love the movies. Love the Disney Parks. Love taking my nephews every year to Disneyland Paris under the guise that it’s for them but it’s really for me. HAHA!! Guess some of us never really grow up!! Tell us what plans you have for the rest of the year, moving into 2017. And also let us know where we can get our hands on your album “No More Holding Back”. The album is widely available on iTunes and all major download sites. Physical copies will only be available at performances and on the tour until the website is back up and running. Thorne-Hill.com is currently under some very exciting refurbishments.